The cuisine of Italy’s German- and Italian-speaking South Tyrol region, near the Austrian border, is nuanced and surprising. Hearty cold-weather dishes like polenta and canederli (dumplings) blend elements of German, Swiss and Austrian cooking, but also have plenty of Italian sophistication. Now ADLER Lodge ALPE, a cozy, luxurious ski-in-ski-out resort on the country’s largest mountain plateau, is offering guests a chance to fully immerse themselves in the region’s food with the “Taste of South Tyrol” offer (€637 per person, based on a three- to seven-night stay). The pastry chef, Elisa Kostner, also has an unusual approach to creating her mouthwatering desserts, which are rooted in the traditions of the Dolomite area but also have her own distinctive touches. “I don’t think about what I want to serve, be it mousse, ice cream or a cupcake, but rather what ingredients I want to use. These could be buckwheat, dandelion, quark, chamomile or honey pollen,” she says. The chefs’ use of local ingredients not only supports the Dolomites’ farmers, it also reduces the travel distances for delivery trucks and, as a result, carbon emissions. The hotel also serves only their own fresh mountain spring water (either flat or sparkling), to avoid the shipping and excess waste associated with plastic water bottles. 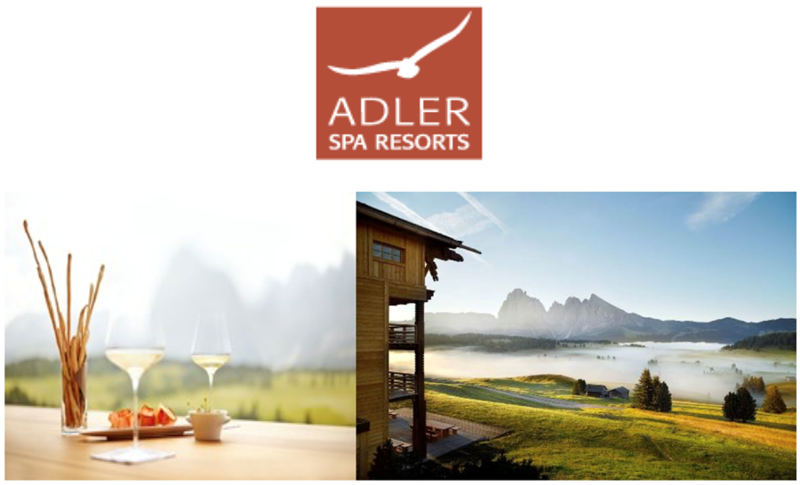 The ADLER Lodge ALPE is set in its own loft within the main building; it’s home to a hay sauna, fitness center and windows offering panoramic views of the rolling meadows and jagged Dolomite peaks. The staff takes pride in helping guests choose treatments that are best suited to their preferences, such as facials, peels, massages, body wraps and wooden tub baths. There are also several combination options (called “rituals”) that mix several different treatments for a truly sublime experience. One relaxation room has a glass ceiling that is especially popular during the evenings, as it allows guests to stargaze in a warm, luxurious setting. are in the center of Oritsei overlooking the mountains, with architecture that’s beautifully integrated into the alpine setting. ADLER Spa Resort THERMAE, in Bagno Vignoni, Tuscany, is famous for its complex of naturally fed thermal baths and pools, totaling more than 1,000 square meters. As the hotels have grown and expanded from their humble roots, one thing has not changed: The Sanoner family, who have owned and managed the properties for seven generations and are passionate about hospitality.